Halberry Castle occupies a promontory a Halberry Head about 8 miles South of Wick and some three miles up the coast from Lybster. Sadly there are no remains visible apart from the vague footings of the keep some 18 metres back from the defensive ditch. The lack of any fragmentary ruins means that this particular site is not generally known of and yet in its day, around 1450, Halberry must have been one of the most impressive fortified structures on that coastline. The promontory upon which it was built was the largest of all the Caithness Castle sites, extending to about 2 acres and it was the stronghold of George Gunn, 7th Chieftain of the Clan Gunn and Crowner, or Coroner of Caithness. Crowner Gunn dispensed the justiciary of the county before the Scottish King created the Earldom of Caithness in 1455 and by all accounts he was an exceptional man and a great commander. He lived here in feudal splendour with his kinsfolk and followers and he wore a great silver badge to signify his authority. Crowner Gunn and a number of his sons were treacherously killed by the Clan Keith at the Chapel of St Tears around 1464 after a running feud between the two clans. The approach to the castle site was very boggy and still is today. The promontory upon which the castle was built is separated by a rock cut ditch about 25 ft wide across which would have been crossed by a bridge, to a drawbridge and gatehouse. The western side of the promontory is protected by a geo or sea inlet, some 150 ft below the level of the site and by similar perpendicular cliffs to the sea on the other two sides. One cannot appreciate the defensive significance and size of the site until you walk to the end of the promontory and look back to the mainland and gaze down the cliffs to the water. The site was very well protected by these natural means and it was with confidence that the keep was built some 50 or 60 feet back from the edge of the ditch, which was unusual for this period. The keep was rectangular in shape, 44 x 28 ft and would have risen to three storeys plus garret and cap house. Its dimensions were just slightly smaller than Ackergill Tower and it therefore would probably have had corbelled bartizans or overhanging turrets at each corner. A defensive wall of enceinte surrounded the whole enclosure and with a site of such significance it is likely there would have been a corner tower with hoarding for sentinels. The enclosure at Halberry would have been large enough to house all the usual ancillary out-buildings and offices associated with a castle such as chapel, stables, brew house, stores, blacksmith, offices, kitchens, washhouse, sleeping accommodations etc. In smaller castle sites, such as Forse, Keiss or Dirlot these timber buildings were usually positioned outside the defences and would have been sacrificed in times of attack. It really is unfortunate that so little remains of this once impressive structure for it would, as a whole, have dwarfed many of the other Caithness strongholds of the time such as Castle of Old Wick, Ackergill and Buchollie. The stones from the castle were used to build a great network of dry stone dykes in the Clyth area in the early part of the 19th century. Permission should be sought from the local landowners before visiting this site and great care should be exercised, as the cliffs are precipitous. 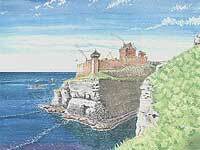 The artistic reconstruction by Andrew Spratt shows how the castle may have looked in 1450.